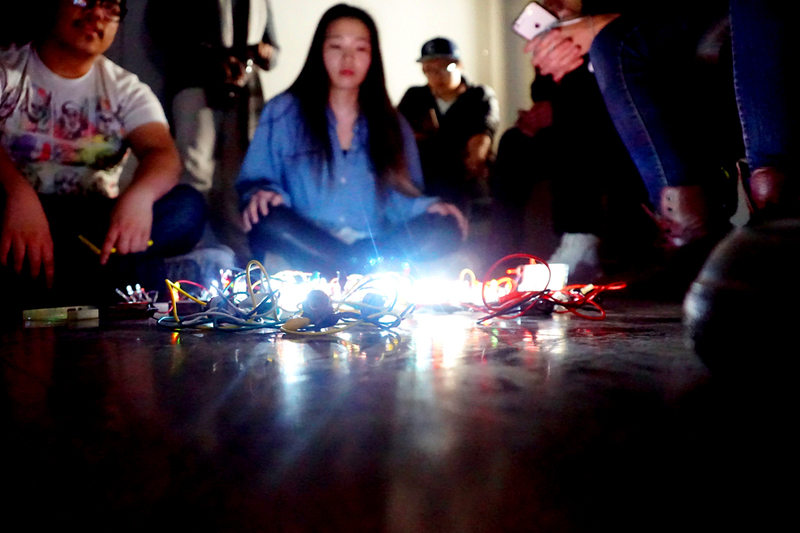 At the end of Skot Wiedmann's interactive arts class, students made a large system by connecting all of their projects so they interacted, with lights blinking in response to one another. Wiedmann described it as sitting around an LED campfire. Maddie Wallace's favorite art class taught her how to solder components onto a circuit board and write computer code. With those skills, Wallace used the electronics platform Arduino to create a shockwave of light. Her creation sent out multiple branches of color to surround a person with a visual shockwave, in response to a flash of light detected by a light sensor in the Arduino circuit board. “The reaction … would start at one side and move around you in a circle,” said Wallace, from Mahomet, Illinois, who will graduate from the University of Illinois in May with a degree in new media. She made the project in an interactive art studio class taught by Skot Wiedmann, an electronics technician in the department of electrical and computer engineering and an instructor in the School of Art and Design. The class is offered each spring semester. “This whole class is about taking electrical engineering skills and applying them to interactive art processes,” said Wiedmann, who has been teaching the class since 2016. The focus of the class shifts each year between coding and building electronic hardware, but both versions of the class explore light in some way. They start with students learning how – through either writing code or building a circuit – to make a light turn on, blink on and off, and blink in a particular sequence or pattern. Then they add sensors to allow interaction between the light and the environment. The students learn how to change various phenomena through either writing code or changing the components on a circuit board, Wiedmann said. Their final projects must be interactive in some way. “They are going from zero knowledge of electronics to building complex, interactive systems with lights and sounds,” Wiedmann said. One of the projects from the spring semester was electronic painting using a paintbrush connected to a wire. When the brush touched a surface, a video was projected over the area being painted. Sara Paige Hoag took the hardware version of the course in spring 2016 in order to learn skills that would help her complete her master’s project in art. She was building boxes containing LED lights that would be suspended from the ceiling, with fiber optic filaments hanging down. The LED lights would light up the filaments in response to a motion detector, creating a pattern of lights resembling rain. “There were certain issues that I kept coming up against in my art that coding couldn’t solve,” Hoag said. The course taught her to build the circuits that would solve those problems. “The really cool aspect of it is, Skot sits between the artist and the electrical science realm. It was really cool to combine those two things,” Hoag said. “It’s a different way of making, and it opens up a cool new way of art that you could make. Art is no longer just painting and drawing,” she said. Wiedmann said he is interested in students experimenting and pushing limits to see what happens. “Building a circuit is useful and interesting, but what I really care about is the aesthetic experience that can be made by interacting with this system,” Wiedmann said.